MAAC Review: KICKBOXER – VENGEANCE | M.A.A.C. 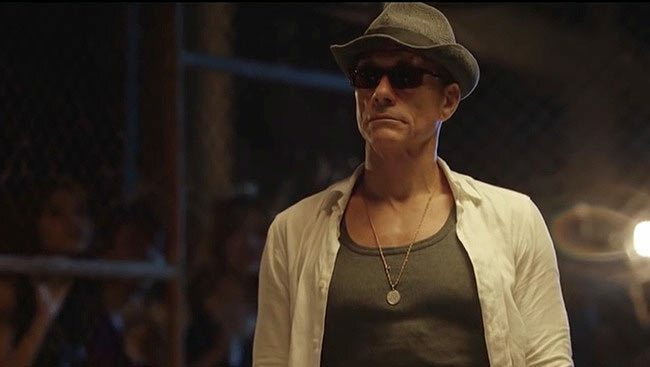 The original 1989 ‘Kickboxer’ was one of my favorite Jean-Claude Van Damme classic growing up, so I have been waiting for this remake to come out since it was first announced. With the potential of the awesome cast (Dave Bautista, Gina Carano, JCVD himself! 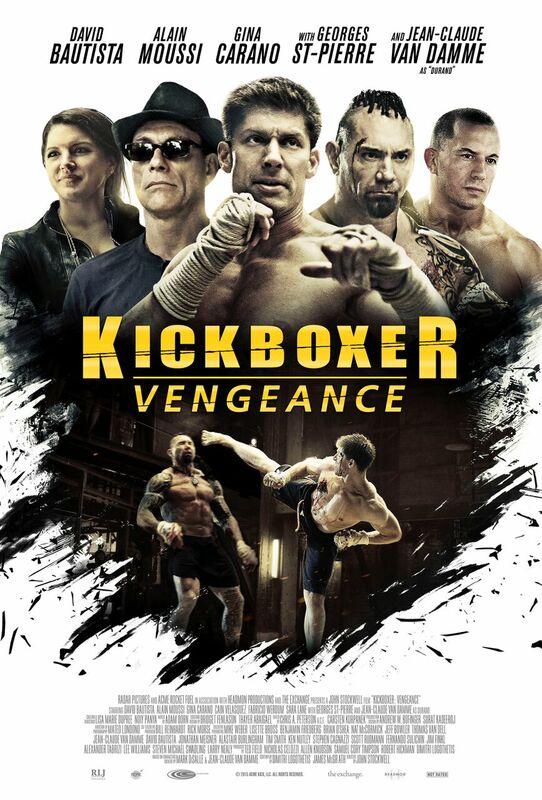 ), leading man ALAIN MOUSSI’s martial arts and stunts background, and the involvement of fight choreographer LARNELL STOVALL (Undisputed 3), I had some pretty high expectations for KICKBOXER: VENGEANCE to say the least. Unfortunately, it did not quite meet that expectation. Do not get me wrong, there is some cool stuff about the film but we will get into that later. Since this is a remake, the story follows the original pretty closely with some added subplot to the mix. In a nutshell, World Karate Champion ‘Eric Sloan’ (played by the late Darren Shahlavi) gets offered a handful of cash for an underground fight in Thailand by a shady promotor (Gina Carano), he gets killed by ‘Tong Po’ (Dave Bautista) then younger brother ‘Kurt Sloan’ (Alain Moussi) seeks training from master ‘Durand’ (JCVD) to get revenge. Lets get the negatives out of the way first. With a veteran action choreographer in Stovall handling the fights, one would expect the action to be on par with the likes of the fan-favorite ‘Undisputed’ films. The choreography is not the problem here. There is plenty of action scenes throughout the film, but the fights were edited with such choppiness it fails to show the actual skills of the performers involved (especially someone as talented as Moussi). For instance, there was a scene where JCVD and Moussi runs through the street of Thailand and throws it down with a few thugs. Moussi then started fighting these thugs on top of elephants. Yes, ELEPHANTS. If that sounds familiar, you have probably seen this done by Tony Jaa ten times better in ‘Ong Bak’. The scene just felt lazy and sloppy. But the editing is not the only thing that is super irritating. For some strange odd reason Van Damme’s voice seems to be dubbed by a really bad impersonator for roughly 30% of the film! Oh yeah, I did mentioned that former MMA Champion Gina Carano (Deadpool) is in the movie. But wait, she does not throw a SINGLE PUNCH. This is equivalent to casting comedian Kevin Hart in a comedy without cracking a single joke. Or Vin Diesel without fast cars. A Michael Bay film without blowing sh*t up. You get my drift. A tad bit disappointing I must say. Now on to the positives. Four words: JEAN CLAUDE VAN DAMME. The man have such charisma as soon as he shows up he lights up the screen. It is great to see him pull a ‘Rocky’ (ala ‘Creed’) to reverse his role from the student in the original ‘Kickboxer’ to the skillful master ‘Durand’. 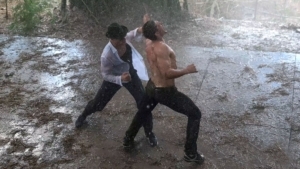 His brief fight scene in the rain with Moussi was beautifully shot. It elegantly showed his superior skills as the master by taking down Moussi with a number of single power kicks. Now why was the rest of the film not shot in the same way blows my mind. His brief fight with former UFC Champion George St. Pierre was not too shabby either. The training scenes was also quite fun. It pays homage to the original by including coconuts but using it in a different way (you will see in the film). It is cool to see the roles reversed with Van Damme doing the torturing this time around. As for leading man Alain Moussi, he really does show potential. Even though his acting is pretty raw being this is his first starring role, we can cut the man some slack. He got the looks and physicality to really improve on what he showed in this film. His final showdown with ‘Tong Po’, played by the menacing Dave Bautista (Guardians Of The Galaxy), is solid. This is where he showed glimpse of what an impressive martial artist he is. He even pulled off the vintage JCVD jumping split kick! So it’s…Just okay… that’s acceptable for me..
Hopefully “retaliation” will be better!! !